Kids of all ages enjoy Easter Egg Hunts. Here’s some fun ideas to host a hunt filled with fun, not frustration. Don’t forget your basket, and let’s get scavenging! 1. Use Plastic Eggs: I use mine from year to year. They are sturdy and small candy is easily hidden inside them. 2. 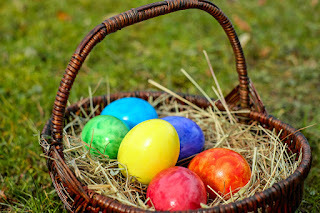 Assign Egg Colors: If you’re hosting an Easter egg hunt for different ages, you can hide the “orange and green eggs” in an easy spot for the younger children, and the “red and blue” eggs in a more difficult spot for older children. 4. If you have a large group of children, divide into teams. Each team could choose a color. Be sure you have an equal number of colored eggs for each team. 6. Use a flashlight or glow stick for a fun, nighttime Easter egg hunt. 7. Choose a grand prize at the end. To avoid too much candy, consider a children’s toy or coloring book instead. Have you ever planned or participated in an Easter Egg hunt? Please share your ideas and experiences in the comments below. One lucky winner will be randomly selected to win a free Audiobook (a $14.95 value! 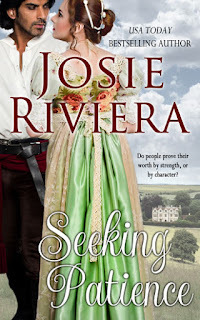 ), of Seeking Patience, my Regency Inspirational romance. Check back tomorrow for winner announcement and details. USA TODAY Bestselling Author Josie Riviera writes Historical, Inspirational and Sweet Romances. She lives in the Charlotte, NC, area with her wonderfully supportive husband. They share their home with an adorable Shih Tzu who constantly needs grooming and live in an old house forever needing renovations. Subscribe to her newsletter to receive a free sweet (and spicy!) short story romance. Don’t forget to sign up for our Sweet Romance Reads newsletter. Scroll down the right side of our blog and enter your email address under Newsletter Signup. And come join us in our Facebook Sweet Romance Reads Cafe too. My mom used to hide eggs in the yard when I was a kid, but my folks divorced when I was like 4...and I don't recall doing it after that. Ashley, Glad that you were able to remember the eggs hidden in the yard, though. Good memory! When our kids were little, we would all get together as a family and have a huge Easter egg hunt after church and a pot luck. We would do a small one at our home, where their basket was hidden somewhere in our house. Our church has been doing a hunt for all ages, where there items like paper towels, food, tools, kindles, even a tv, and new Bibles. After the hunt, everyone is invited inside to get the bigger items, and then there is a small devotional. Your church certainly has some great ideas! Thanks for sharing. We always did them in our yard..but when our son was old enough..he wanted to be the Easter Bunny ....our local town does a town hunt..and he saw the Easter Bunny and wanted to be him! When he was big enough to wear the costume..he was!! Did it for several years...he just loved doing it!! So fun that your son wanted to be the Easter Bunny! Creative and clever. We used to hide plastic eggs for the kids until the year one was never found. We think a dog must have found it. Great tips, Josie. Thanks so much for sharing. Thanks for the fun ideas, Josie! Glad you were able to stop by, Patricia. We put coins in the plastic eggs. Some only have a few pennies, but some have 4 quarters in them. The children love them and can get there selves something the day after Easter, when things drop 50 percent. Like a new stuffy as my granddaughter calls them. Such great ideas! I'm going to implement them this Easter. Our family always had egg hunts. Doing them in the gardens and on the farms gave us lots of places to hunt! Now I do not have young ones around to put the hunt on for; I miss it. Thanx for the giveaway. Happy Easter. How lovely to have an Easter egg hunt in the garden and farm, Jennifer. And you're very welcome. My pleasure! Thanks for stopping by, Merrillee! Thanks for so many wonderful comments. Jennifer Hibdon, you're the winner! Please contact me at josieriviera@aol.com to claim your audiobook copy of Seeking Patience.